The Office of Student Success & Completion’s mission is to support student enrollment and completion by providing outstanding service, proactive leadership, and ongoing support to the Lone Star College campuses so that they may recruit, admit, and enroll students effectively and efficiently. College students are more likely to complete a degree in a timely fashion if they choose a program and develop an academic plan early on, have a clear road map of the courses they need to take to complete a credential, and receive guidance and support to help them stay on the path. Guided pathways integrate these and other evidence-based reforms with the goal of ensuring that they become part of every student’s college experience. 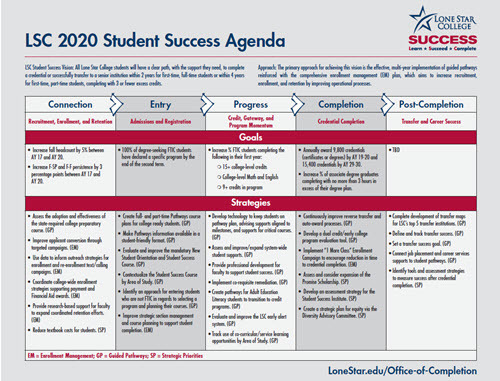 At LSC, the primary strategy for achieving our student success goals (increasing completion and reducing time and credits to degree) is the college-wide, multi-year implementation of guided pathways reinforced with the comprehensive strategic enrollment management (SEM) plan. Key outcomes include: program maps for full- and part-time students, reorganizing programs into eight Areas of Study, reorganizing advising around the Areas of Study and student progress milestones, implementing scaled academic and non-academic supports, and putting technology in place to support all of the above. Pathways also continues the work of LSC’s 2015 Completion Plan by building on and improving new student orientation, the student success course, early alert, and other previous reforms. 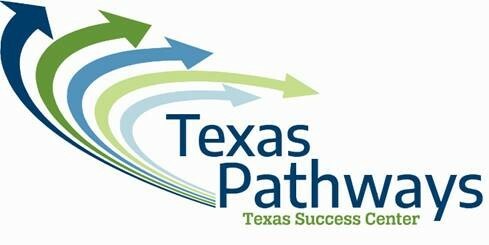 LSC participates in the Texas Success Center’s Texas Pathways initiative and Pathways Institute Series (closely based on the national AACC Pathways Project), which is helping Texas community colleges design and implement the pathways model at scale. Houston Guided Pathways to Success is a regional collaboration led by the University of Houston that aims to provide a timely, structured, and seamless pathway for students transferring from Gulf Coast-Houston-area community colleges to Houston-area universities. Eleven institutions encompassing more than 300,000 students make up the Houston GPS alliance: College of the Mainland, Houston Community College System, Lone Star College System, San Jacinto College District, Texas Southern University, University of Houston, University of Houston-Clear Lake, University of Houston-Downtown, University of Houston-Victoria, Victoria College, and Wharton County Junior College. Key areas of effort include: math alignment to majors, co-requisite remediation, meta-majors and default degree maps with critical path courses, proactive advising and informed choice, and structured schedules. Led by Lone Star College, the Texas Completes cadre brings together eight college systems (Alamo Colleges, Austin Community College, Dallas County Community College District, El Paso Community College, Kilgore College, Lone Star College, Odessa College, and South Texas College) that share a common vision for transformative student success reform. By leveraging and accelerating existing reform efforts and creating a center of gravity for innovation, the cadre hopes to provide a clear road to both associate's degree attainment and improved transfer, to break down silos within colleges to enable stronger support and engagement, and to create the infrastructure for coherency between the segments in much of the state. Achieving the Dream is a national, nonprofit leader in championing evidence-based institutional improvement for community colleges, with a particular focus on students who traditionally face the most significant barriers to success. Created in 2004, the ATD network now includes over 220 institutions of higher education across 39 states. As a member since 2006, Lone Star College has used ATD’s strategic framework, best practice recommendations, and coaching services to regularly assess and improve our student success efforts. This work includes an annual reflection on college-wide progress and challenges in seven key areas: Leadership & Vision, Data & Technology, Equity, Teaching & Learning, Engagement & Communication, Strategy & Planning, and Policies & Practices. Strategic enrollment management (SEM) is a comprehensive process designed to maintain optimum recruitment and retention of students. At LSC, SEM is used to identify, implement, and assess research-based, data-driven, college-wide strategies to increase enrollment and retention. The SEM Council was established in 2016 to develop a SEM 2017-2020 plan, to engage and support campuses, and to begin implementing short and long-term strategies (e.g. re-enrollment calling campaign).